by Network for the Abolition of External Debt and the Recognition of the Ecological Debt - Who owes whom? Southern countries live under the yoke of debt crisis since the seventies, and have been forced to cut social spending by the severe austerity policies imposed by the IMF and World Bank, in order to prioritise debt payments to international creditors. The fire alarm signals have now gone off in the North as Greece, Ireland and Portugal, unable to pay their debts, have been forced to accept the "bailout" imposed by the IMF and the EU, fake "rescues” that follow the path of the austerity policies of structural adjustment programs imposed to impoverished countries. And at this point ... is Spain different? Several economists confirm that Spain is likely to follow the path of the other peripheral countries and will be driven into a "rescue” to solve its debt problem. Greece, Ireland and Portugal are now more unjust, impoverished and unequal countries than they were before the "bailouts". These policies, clearly unfair, not only do not facilitate economic recovery, but it increase the dependence of the indebted countries in financial markets, making governments less accountable to their people and generating high levels of poverty and unemployment. It’s "rescue" for those economic and financial elites that have led to the crisis. And when improvements are announced, these will be for the minority favoured by the capitalist economic model that hides behind huge inequalities and injustices of the cold macroeconomic figures. What if we do not pay? Only when people claim their rights and oppose austerity measures, the payment to financial institutions and the unsustainable debt burden, we glimpse a possible recovery. This is what happened after the default in Argentina in 2001. More recently, the Icelandic people have refused to pay for taking the errors of those who have led their country into the abyss, saying ’no’ to the repayment of a debt patently invalid. The Icelandic solution has led to the restoration of democracy asserting the will of the citizens against the arbitrary exercise of public power is always influenced by the big banks and the neoliberal consensus in the international environment. 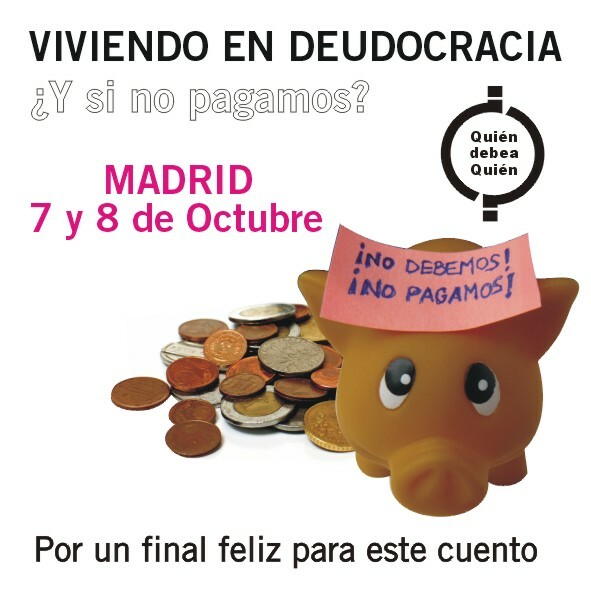 To deepen in the understanding of the debtocracy we live in and its impact on social rights, and to analyze the alternatives, we invite you to participate, the 7th and 8th October in Madrid, in the meetings "Living in debtocracy: Debt in the North: learning from the South"
The crisis in other parts of Europe: perspectives. Alternatives and resistance to the debt in the North. Building bridges with the South. With the participation of the majority of speakers from the tables 1 and 2 and Carmen Rodriguez of the Economics Commission - 15-M Movement in Madrid. All the Saturday sessions will have simultaneous translation from Spanish to English and vice versa. Organizes: Network for the Abolition of External Debt and the Recognition of the Ecological Debt - Who owes whom?